Battles and Dynasties explores the conflict for the crown from Domesday to present day through fascinating documents, paintings and artefacts each fundamental to our local and national heritage. Battles and Dynasties charts the succession of the monarchy and the battles fought to win and secure the crown over the last 900 years, including a host of nationally-significant artefacts and local treasures. It's an unmissable opportunity to see significant pieces on our doorstep here in Lincolnshire, including major objects and paintings that are rarely shown outside of London and some things from private collections that are never on display. Among the treasures on display are Queen Victoria's throne, the death warrant for Mary Queen of Scots, Edward VIII's abdication letter and William the Conqueror's signed order for the creation of Lincoln Cathedral. In addition, there are fascinating letters from Henry VIII, royal photographs from the 20th century and much more. The exhibition complements the visit of The Domesday Book, the country's earliest surviving public record, which is on display at Lincoln Castle until Sunday 3 September. Combined they offer visitors an amazing summer of history in Lincoln. All Inclusive tickets to see Domesday will also get you access to the Medieval Wall Walk, Victorian Prison and Magna Carta. This exhibition has been made possible as a result of the Government Indemnity Scheme. The Lincolnshire County Council would like to thank HM Government for providing Government Indemnity and the Department for Culture, Media and Sport and Arts Council England for arranging the indemnity. 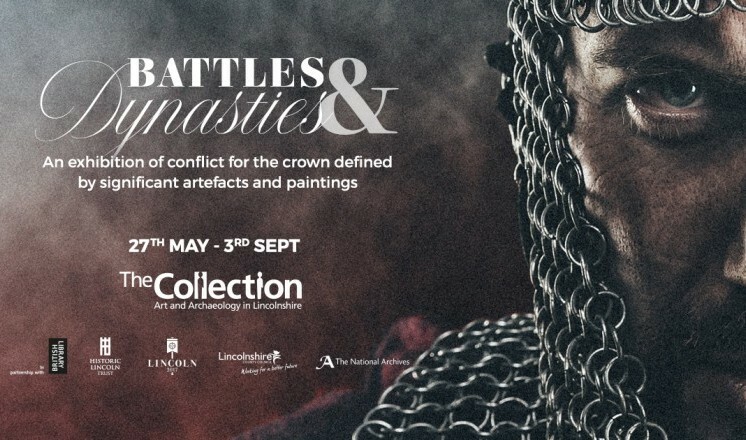 Battles and Dynasties has been brought together by Lincolnshire County Council and Lord Cormack in partnership with the Historic Lincoln Trust, The National Archives and the British Library.